Guys, I have been wanting to get this lipstick for YEARS ever since I first saw it on the Barry M website! It’s a quirky little thing isn’t it? This lipstick works by working with the alkali levels in your lips to determine how pink the shade will be. I would say though, that I would class this as more of a lip stain than an actual lipstick, as it has the same consistency as a stain and lasts a bit longer also. 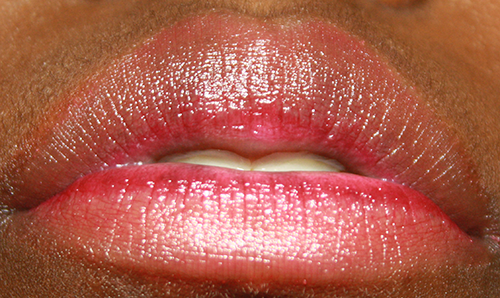 So, the more alkaline you have in your lips, the brighter pink the lipstick will be. Get it? Got it? Good. Because of it changing on each person, I believe that this is a shade that can be worn and could suit virtually anyone. The photo above shows what happened when I rubbed a little lemon juice on the insides of my lips only and then applied the lipstick on top. In general, I think this is cute, quirky little lipstick that’ll make a great stocking filler and has great longevity, about 8 hours or so before re-applying. Priced at £5.49 from boots, superdrug and amazon. Would you try this? What are your favourite novelty products?